Luton Town will head to Championship side Sheffield Wednesday in the FA Cup third round after the draw was made this evening. 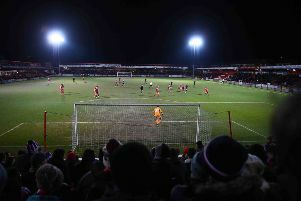 The Hatters reached this stage of the competition by beating Bury 1-0 in the second round on Saturday. Town have never faced the Owls in the FA Cup, with their last trip to Hillsborough coming in the Championship back in August 2006, winning 1-0 through Lewis Emanuel's goal. Full draw: Bolton v Walsall or Sunderland; Millwall v Hull; Gillingham v Cardiff; Brentford v Oxford; Sheffield Wednesday v Luton; Manchester United v Reading; Everton v Lincoln; Tranmere or Southport v Tottenham; Preston v Doncaster; Newcastle v Blackburn; Chelsea v Nottingham Forest; Crystal Palace v Grimsby; Derby v Southampton; Accrington Stanley v Ipswich; Bristol City v Huddersfield; Wrexham or Newport v Leicester; Fulham v Oldham; Shrewsbury v Stoke; Solihull Moors or Blackpool v Arsenal; Manchester City v Rotherham; Bournemouth v Brighton; West Ham v Birmingham; Woking v Watford; Burnley v Barnsley; QPR v Leeds; Sheffield United v Barnet; Norwich v Portsmouth; Guiseley or Fleetwood v Wimbledon; West Brom v Wigan; Middlesbrough v Peterborough or Bradford; Wolves v Liverpool; Aston Villa v Swansea.